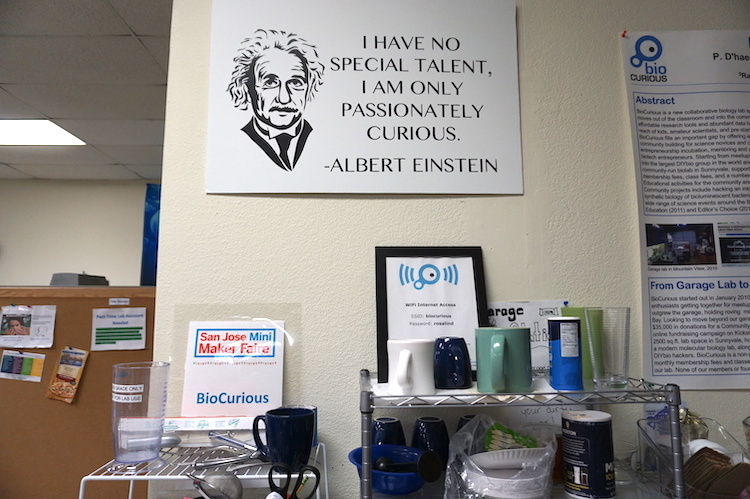 In California, community biology laboratory BioCurious is a catalyst for innovation in biotechnology, where biohacking is accessible to anyone, from independent researchers and entrepreneurs to budding citizen scientists. Makery stopped in for a visit. Once inside BioCurious, Einstein sets the tone. BioCurious has come a long way in the past seven years. First conceived as a DIY biolab inside a garage, it was reborn through a crowdfunding campaign as a community laboratory renting commercial space in Sunnyvale, before maturing into the pioneering biohackerspace it has since become, while settling into its current location in Santa Clara, in the South Bay of San Francisco. Officially founded by a handful of biology-oriented entrepreneurs in late 2010, the not-for-profit BioCurious seems very much at home in the biotech heart of Silicon Valley. It counts about a hundred active members, with a broader community of several hundred. 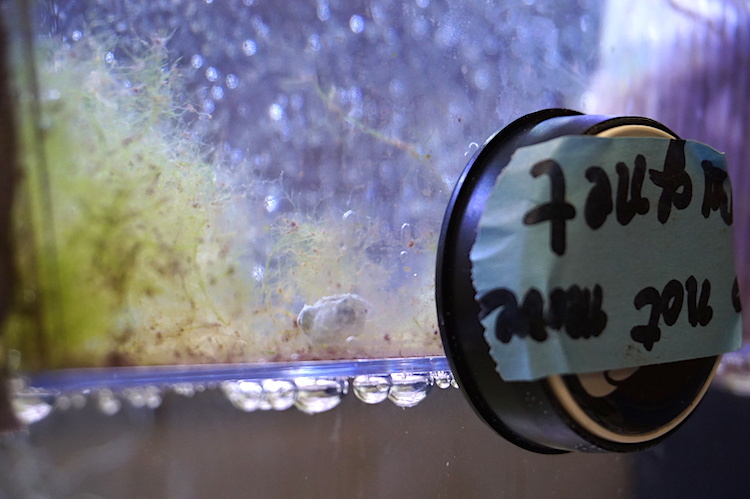 In the daytime, the laboratory provides a dedicated space for members to work on their own projects, while almost every evening the space hosts bio-themed meetups and ongoing community projects. On weekends, visitors often include families and teenagers participating in science fairs or other student activities. 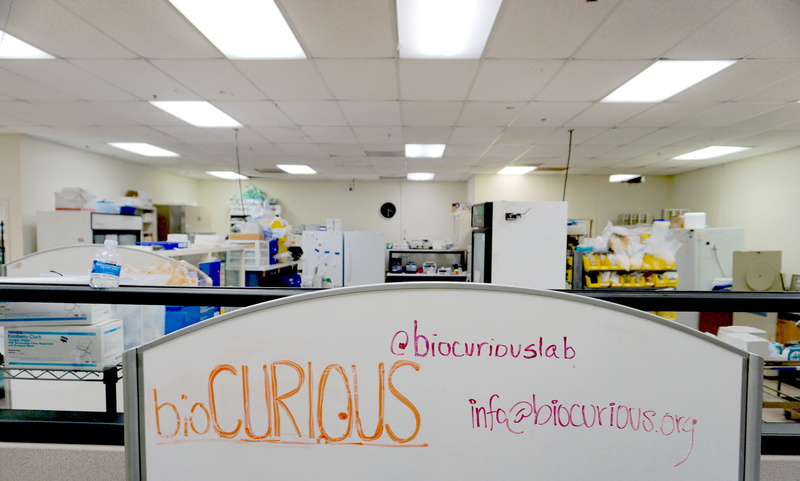 Beyond the whiteboard, the BioCurious lab zone. 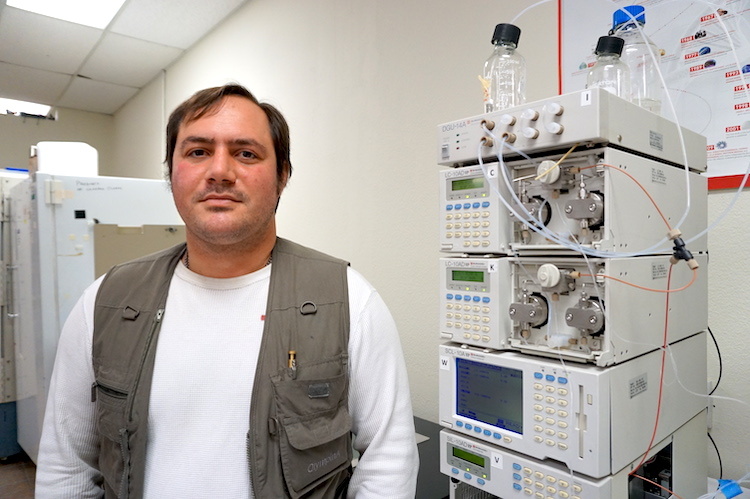 Innokenti Toulokhonov, a current board member of BioCurious, was one of the lab’s early members when he joined in 2012. Like many individuals, he was looking for affordable and fully equipped biochemistry lab space to work on personal side projects. It was here that he launched his startup, Amid Biosciences, which provides services in protein engineering and gene cloning for research in life science. Another benefit of BioCurious, he points out, is that it never takes any intellectual property or ownership of your future or current projects. One of BioCurious’s first original community projects is the BioPrinter, an inkjet printer hacked into a 3D printer of… human organs. While the DIY machine hasn’t quite yet achieved its ultimate purpose, its process of transformation and operation, printing plant cells such as bamboo, is already being used as a collaborative educational project in which anyone can participate—including people beyond the Bay Area, across the U.S. to Florida, and even teenagers working on the software in Brazil. As for the mystery tank by the entrance, it houses a male dwarf cuttlefish (Sepia bandensis), who is the subject of another community project to sequence his genome and edit his RNA. (Wanted: female dwarf cuttlefish.) A current deviation, which also involves high school students, biologists and software engineers, is to create “immortal” cell lines from the original cuttlefish cells. A dwarf cuttlefish waits for his cell lines to be immortalized. If the award-winning Real Vegan Cheese project may be the most famous collaboration between BioCurious and Counter Culture Labs (CCL) in Oakland (which Makery also visited), perhaps the most fruitful is Open Insulin (first covered here). While the core team—protein biochemist Yann Huon de Kermadec, an anthropologist and a handful of other active members—base their work at CCL in the East Bay, Anthony Di Franco, Type 1 diabetic and instigator of the project, is exceptionally at BioCurious in person today to meet me. And he brings good news. They are also doing additional tests to double-confirm the results, while talking to lawyers about how they can safely and legally scale up and distribute the technology. Anthony Di Franco, instigator of the Open Insulin Project, next to the HPLC at BioCurious. Kurt Cheng prepares DNA samples at BioCurious. 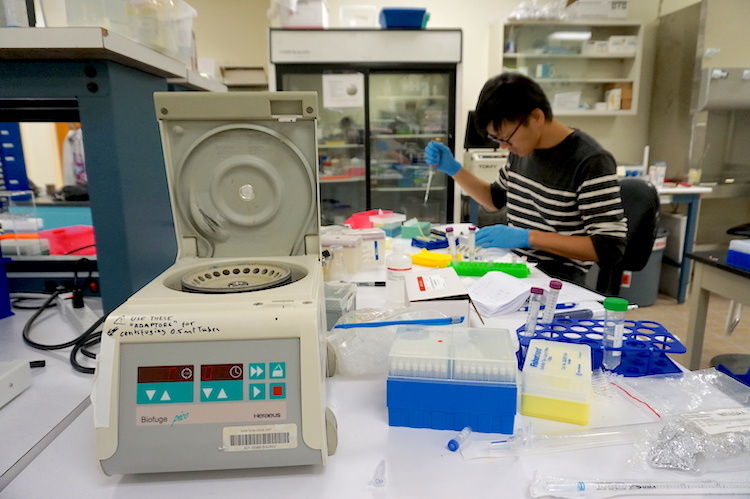 Meanwhile in the lab zone, Kurt Cheng is busy preparing samples for commercial DNA sequencing. Since becoming a member of BioCurious in 2016, he often uses the laboratory space to sequence DNA or even a whole genome for his clients. At the lab, he has also met new collaborators, many of whom are biotech researchers interested in leveraging this technique for things such as cancer detection or understanding a microbiome or the DNA of a specific species. In a guided tour of the surrounding lab space, he shows me a centrifuge, a multifuge, an autoclave, a thermocycler, a shaking incubator, a rotating oven, a refrigerator used to store DNA at -20c, a freezer used to store RNA at -80c, a microscope that can see fluorescent genetic engineering, an HPLC to analyze chemical components… Most of the machines are vintage but functional, and all of the equipment has been donated. 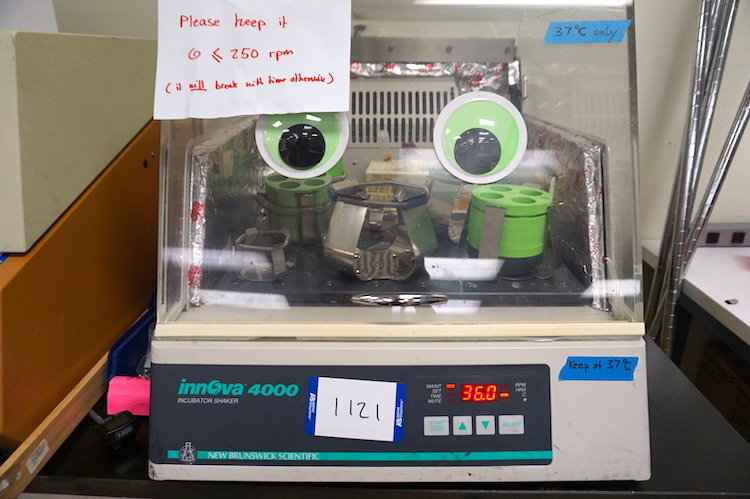 A shaking incubator, which facilitates bacteria growth, personalized with BioCurious googly eyes. In a smaller room, another member has invested in his own specialized equipment to install a customized workspace for a personal research project in electrophysiology. Two years ago, Edward Beck moved up to the San Francisco Bay Area from San Diego, where he was unable to find work in his field at the PhD level, purposely to join BioCurious, which offered affordable lab space in a supportive environment, so that he could pursue his own research. At BioCurious, Edward wants to explore a novel approach to be able to control this opening and closing of ion channels in nerve cells. While one up-and-coming approach over the past ten years is optogenetics, which uses light traveling through invasive fibre-optics, Edward proposes to use external magnetic fields to change the way ion channels open and close. 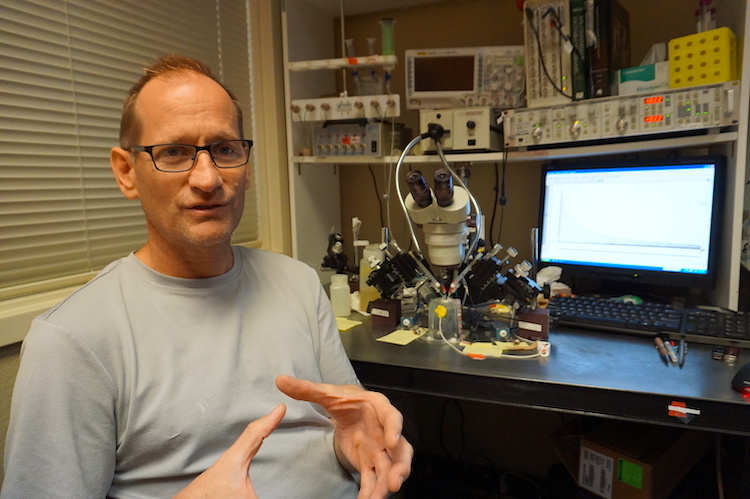 Edward Beck explains his electrophysiological research in front of his custom workspace at BioCurious. The electrophysiologist demonstrates the mechanics of his customized set-up, in which two glass electrodes poke straight down into the bottom of a dish, very delicately penetrating the membrane of a nerve cell inside a frog egg. The electrodes are connected to amplifiers, and a digital-analogue converter connects the signal to a computer, where Edward can program a specific set of voltage changes during the course of the experiment. 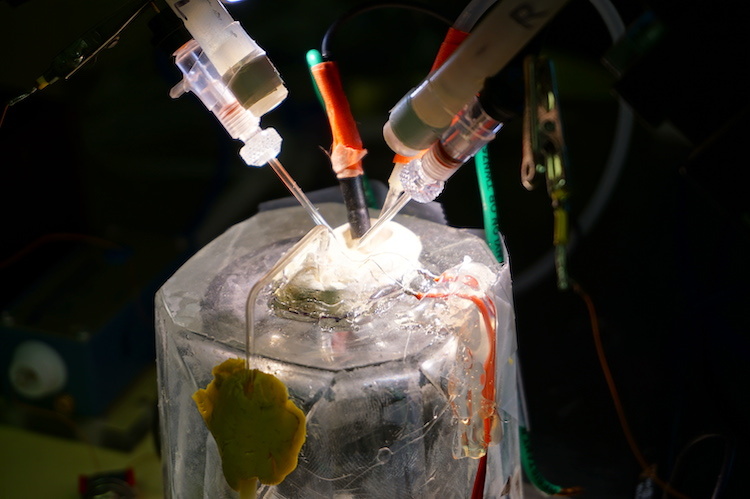 Two electrodes will delicately penetrate the membrane of the nerve cell in a frog egg. Edward plans to give his research project at least another three years. If he gets convincing enough data to show a proof of concept, he can use it to apply for a federal grant to take his research further. Another advantage of BioCurious is that it has the credentials to host research grants from the government. After that, who knows where the research can lead? Magnetic nerve cell manipulation, DIY insulin production, 3D-printed organs, immortal cuttlefish cell lines… Which is most likely be the next big biotech breakthrough to come out of a community biolab? Just curious.